The most beautiful example of Blaeu's city map of Moscow. Царствающои град Москва началнои город всех московских государствах. / Carstvajuščoi grad Moskva načalo I gorod všeh Moskovech I carstvach. Urbis Moskvae. 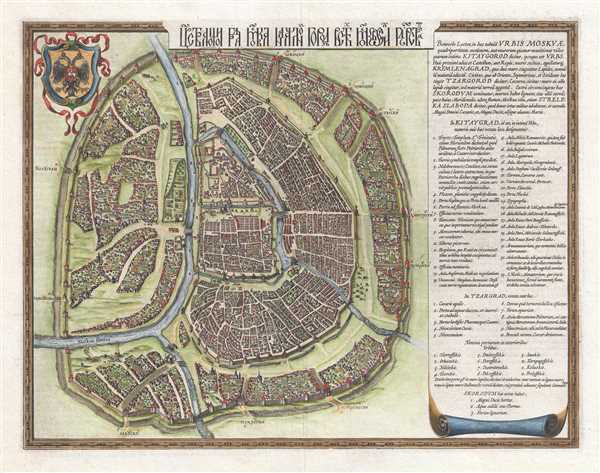 This is a 1642 Hessel Gerritsz city map or plan of Moscow, Russia. With the Kremlin at its center, the map depicts the city from the city from the Moscow River to Zemlyanoy Gorod, which is surrounded by ramparts and a moat. This historical district in Moscow corresponds to the area between the Boulevard Ring and the Garden Ring roads in modern Moscow. An index situated along the right border corresponds with nearly sixty different numerically labeled locations throughout Moscow's three districts. A text, in Latin, is included above the index. It is believed that this map is derived from survey that was ordered by Boris Fyodorovich Godunov, who ruled the Tsardom of Russia as de facto regent from c. 1585 until 1598 and then as the first non-Ririkid tsar from 1598 until 1605. The original plan is not believed to have survived. It is commonly believed that this map was not published in a Blaeu atlas until 1662, though earlier editions of Gerritz's Kremlenagrad map are known to have been published in Braun and Hogenburg's Civitates orbis terrarium, which does not rule out the possibility that Gerritsz's plan of Moscow was also published in Hogenburg's atlas. When we obtained the present example, the seller claimed that it was extracted from a 1642 Dutch edition of Blaeu's atlas, which would be an edition of Blaeu's Tooneel des Aerdrycks. Through our research, we have concluded that it is undeterminable exactly from which atlas this example was extracted; it could have been printed in a 1642 edition of Blaeu's Tooneel des Aerdrycks or in a 1662 edition of Blaeu's Atlas Maior. As a side note, this is the most beautiful example of this map we have seen to date or could imagine and, for the discriminating collector, this is the one to buy. Hessel Gerritsz (1581 – September 4, 1632) was a Dutch engraver, cartographer, and publisher active in Amsterdam during the late 16th and early 17th centuries. Gerritsz is considered to be the preeminent Dutch geographer of the 17th century. He was born in Assum, a town in northern Holland in 1581. As a young man he relocated to Alkmaar to accept an apprenticeship with Willem Jansz Blaeu (1571-1638). He followed Blaeu to Amsterdam shortly afterwards. By 1610 he has his own press, but remained close to Blaeu, who published many of his maps. In October of 1617 he was appointed the first official cartographer of the Vereenigde Oost-Indische Compagnie (Dutch East Indian Company) or VOC. A strategic position that offered him unprecedented access to the most advanced and far reaching cartographic data of the Dutch Golden Age. Unlike many cartographers of his period Gerritsz was more than a simple scholar and showed a true fascination with the world and eagerness to learn more of the world he was mapping in a practical manner. In 1628 he joined a voyage to the New World which resulted in several seminal maps published by Joannes de Laet. Among his more prominent works are a world map of 1612, a 1613 map of Russia by the brilliant Russian prince Fyodor II Borisovich Godunov (1589 – 1605), a 1618 map of the pacific that includes the first mapping of Australia, and an influential 1630 map of Florida. Gerritsz died in 1632. His position with the VOC, as well as many of his printing plates, were taken over by Willem Janszoon Blaeu. Johannes Blaeu (September 23, 1596 - December 21, 1673), also known as Joan Blaeu, was a Dutch cartographer active in the 17th century. Johannes was the son of Willem Janszoon Blaeu, founding of the Blaeu firm. Like his father Willem, Johannes was born in Alkmaar, North Holland. He studied Law, attaining a doctorate, before moving to Amsterdam to join the family mapmaking business. In 1633, Willem arranged for Johannes to take over Hessel Gerritsz's position as the official chartmaker of the Dutch East India Company, although little is known of his work for that organization, which was by contract and oath secretive. What is known is his work supplying the fabulously wealthy VOC with charts was exceedingly profitable. Where other cartographers often fell into financial ruin, the Blaeu firm thrived. It was most likely those profits that allowed the firm to publish the Theatrum orbis terrarum, sive, Atlas Novus, their most significant and best-known publication. When Willem Blaeu died in 1638, Johannes, along with his brother Cornelius Blaeu (1616 - 1648) took over the management of the Blaeu firm. They vastly expanded and updated the Atlas Novus to a remarkable 12 volumes. Under the brothers' capable management, the firm continued to prosper until the 1672 Great Amsterdam Fire destroyed their offices and most of their printing plates. Johannes Blaeu, witnessing the destruction of his life's work, died in despondence the following year. He is buried in the Dutch Reformist cemetery of Westerkerk. Johannes Blaeu was survived by his son, also Johannes but commonly called Joan II, who inherited the family's VOC contract, for whom he compiled maps until 1712. Very good. Even overall toning. Large margins. Blank on verso.